Today is the launch of eircode, Ireland’s new postcode system. From a technology and privacy perspective, there are potentially numerous benefits to adopting such a system in Ireland. A postcode should ensure that private mail gets delivered to where it should be delivered, not to the home of a similarly named relative and not to a house with a similar address a few miles up the road. It should also allow streamlining of logistics and service delivery, allowing immediate benefits for ordinary people. However, this is not what has been delivered to Ireland’s postal customers. Ireland’s postcode departs from all the international best practice and as a result, brings with it significant issues including privacy and data protection concerns. If you visit a retailer’s website in the UK, you can find the nearest branch of that store by typing in your postcode (something like SE4 2ED). That reveals to the retailer the broad brush strokes of where you live, but only to the nearest 20 or 30 houses. The retailer does not know exactly what house the enquiry came from. If you key in an Irish eircode on a similar site in Ireland, however, the retailer will know exactly what house you are enquiring from. If the retailer is unscrupulous, this information can then be used to target direct mail to your address in relation to the type of product you were interested in. What’s worse, the unscrupulous retailer may pass on your details to one of the global Internet ad networks, enabling them them to target advertising directly at your household when you browse the Internet. There is little that can be done to remedy this bad design now, but there should at least be a deterrent for unscrupulous operators. Unfortunately, the powers of the Data Protection Commissioner to police such activity are very limited and the fines that can be imposed are very small. If your privacy is breached, you have no right to sue for damages. We think this should change. The DPC should have the powers and the fines she needs to crack down on this activity (as is proposed in forthcoming EU legislation). The DPC should be able to prosecute offences that happen outside Ireland. Citizens in Ireland should be able to sue companies that abuse their private information, as they can do in Northern Ireland and Britain. Ah I see we have just been moved from Meath into Louth by #eircode. Cheers! 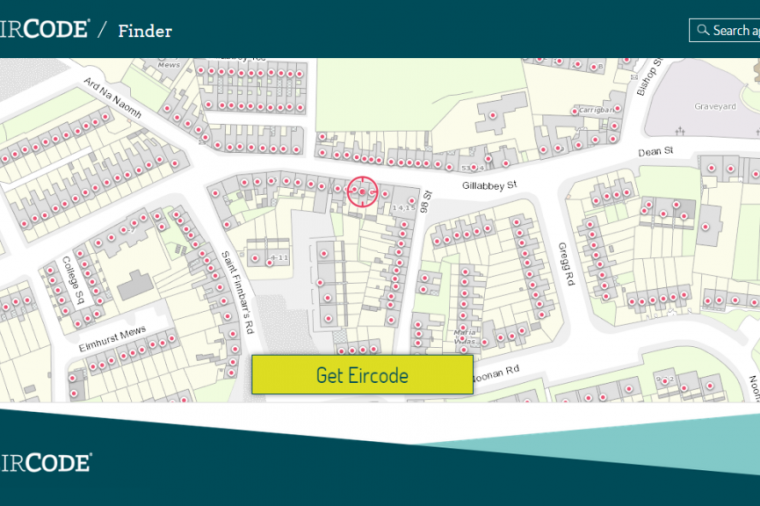 Another problematic part of the scheme is the postcode database and the plan for how codes will be distributed. What makes things worse is that Eircode has been given special permission by the government to use other databases, such as the TV licence database to address the ‘eircode letters’ to individual houses. It is very likely that thousands of houses will also receive the wrong eircode in a few weeks and this will result in needless confusion. Commercially, we do not think the eircode is very viable. The government would have been better off to follow best international practice, as found in the UK and elsewhere, and make the postcode system open source, so that it can be used in a much wider variety of beneficial ways. At the moment you have to pay if you want to look up more than 15 eircodes, which is not even enough for even a modest holiday card list. We do not think the revenues from licence fees will be sufficient to cover the massive costs that have been incurred with this overwhelmingly complex and inadequate code. Ireland’s taxpayers will be left to pick up the bill.